Slip into the single breasted-jovi an open toe dress sandal with a strappy embellished upper. Pair with your favorite little black dress for a perfect special occasion ensemble. Following her own set of rules Betsey Johnson has been creating a full clothing, shoes, handbags, accessories, fragrance, eye wear and jewelry collection for the past forty five years. Betsey Johnson's fun and whimsical designs are infused with a touch of rock and roll thus creating eye-catching, statement making clothes, footwear and accessories. With us you can shop hard to find Betsey Johnson lace pumps in a variety of colors, cute kitten heels to wear all day and keep your feet comfortable but fashionable, and rhinestone embellished flats and sandals. 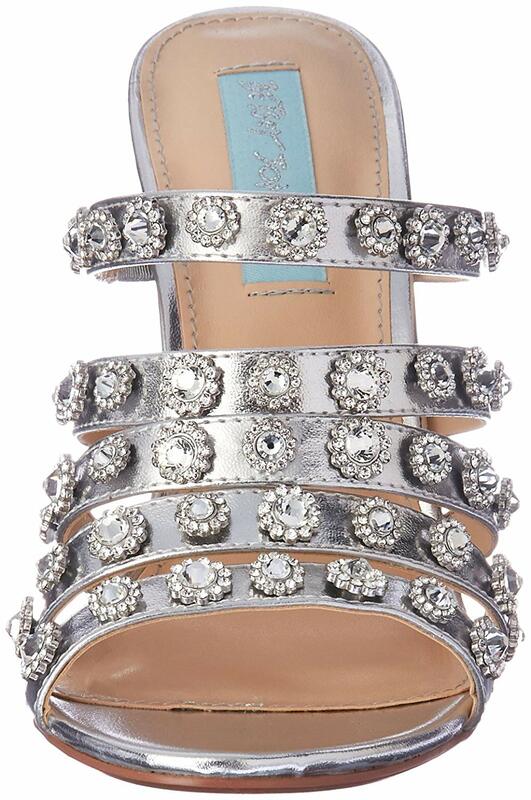 Here we carry Betsey Johnson's sassy footwear in a variety of colors, sizes and textures such as pretty ballerina flats, wedding pumps and high heeled wedding sandals, glitter flats and pumps, embellished wedge sandals, trendy platform sandals, summer sandals and fashionable, trendy boots for every occasion. Our store has a full collection of the most popular Betsey Johnson's footwear to wear from day to night from party to party in every style. / Buy with confidence! Betsey Johnson Womens footwear would make a great addition to your shoe collection!